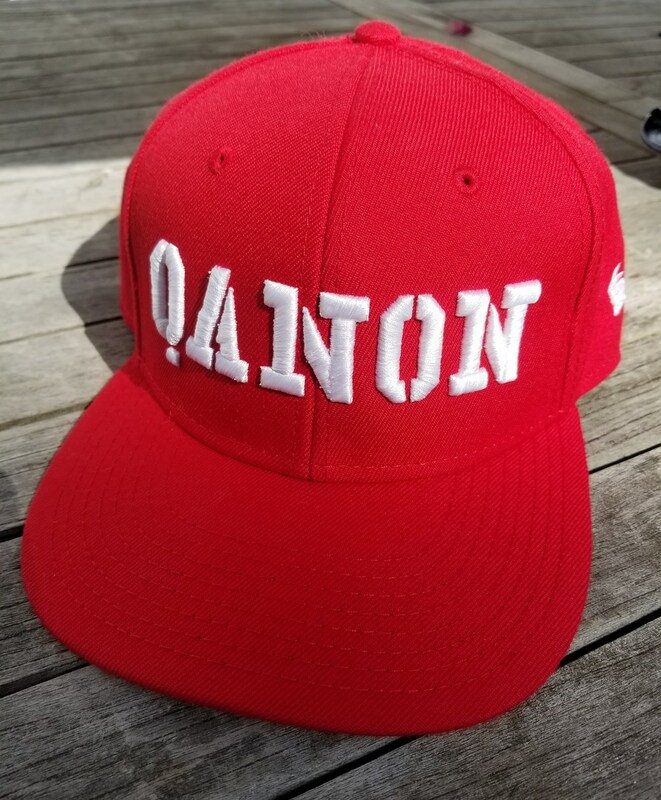 I do believe Q is referring back to the black hat that tried to make contact with him on the boards the other night. Because the consensus seems to be that POTUS and team played a very long con on bad actors here. 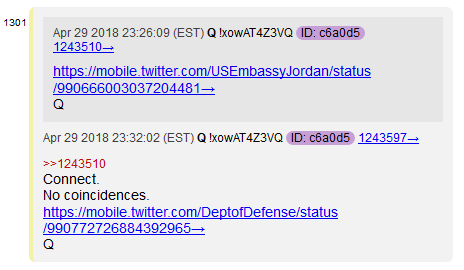 Remember, Q always said: Disinfo is necessary. 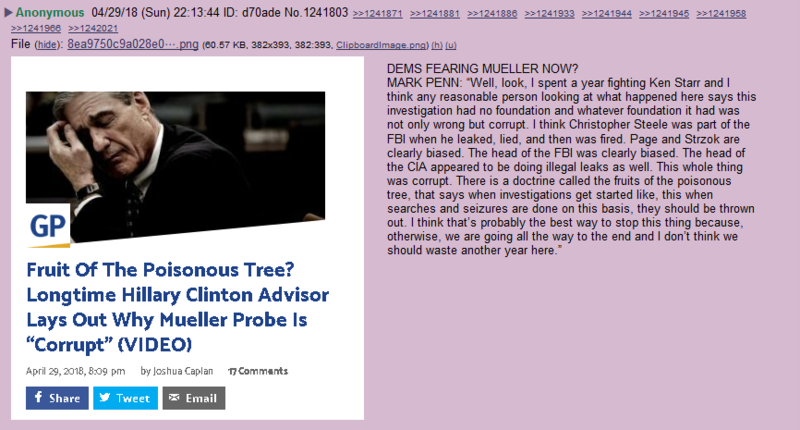 So they baited Dems into think Mueller was going after Trump for the longest time. 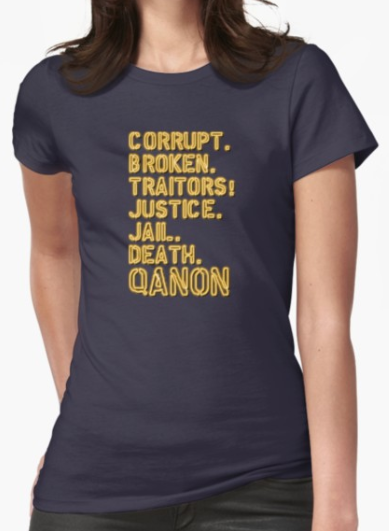 Remember how mad Q was when it leaked early that Trump wasn’t being investigated? 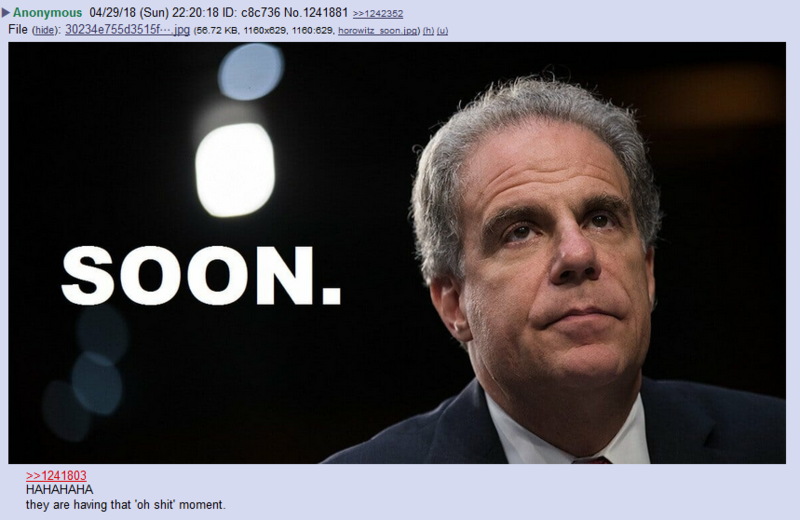 So they had to set up enough of a narrative to make everyone think he was still being investigated. I love the glee. 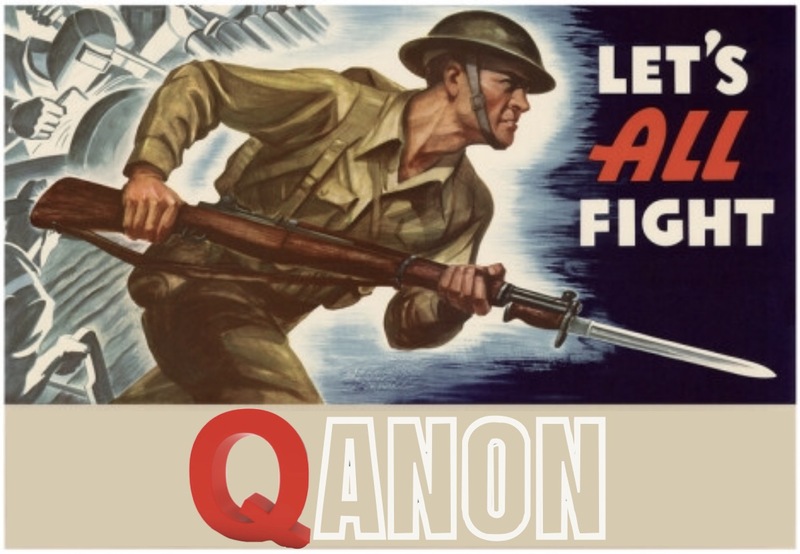 Anons are the best. 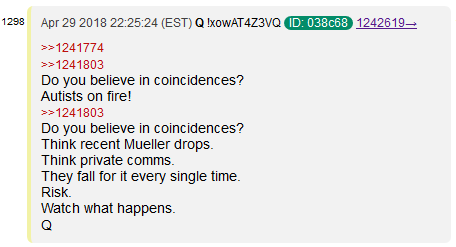 Now, here comes a chance to expand your thinking: Do you think Q team would let that out of the bag, if they weren’t ready to strike? 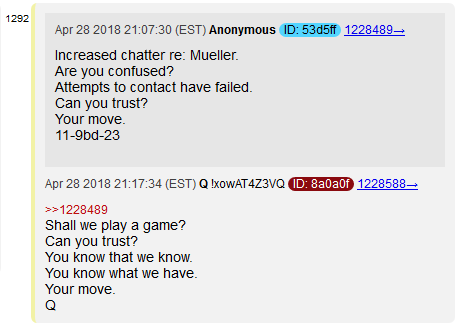 Q’s comms got a little scrambled here, and he didn’t have his Trip code for this post, so he logged back in and confirmed that this was actually from him. 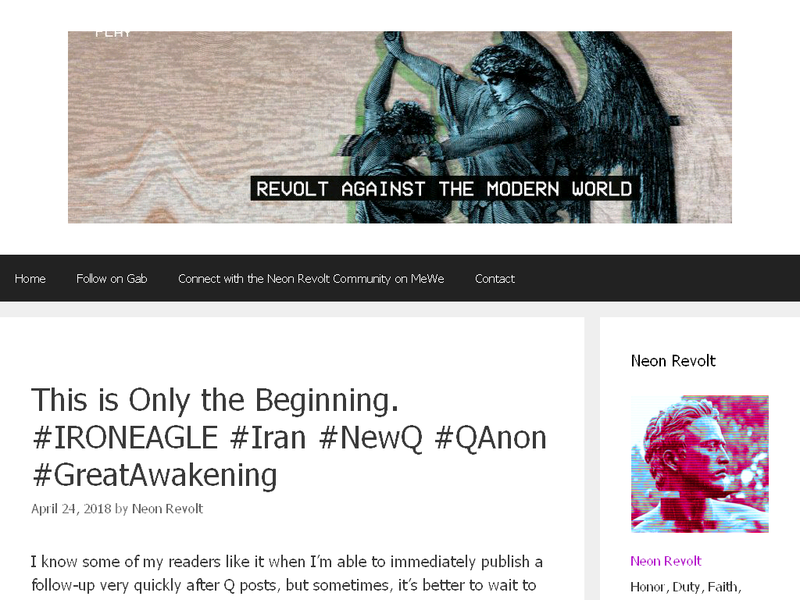 The gist of it is – and it’s not super important – is that some anons were questioning how EagerLion18 could equal Iron Eagle, when there’s a missing R.
Q responds with R = 18. So, personally, I’m taking this as a pretty good #QConfirmation for my theory that Obama using Iron Eagle as a shell company. But that’s just me. If I had to guess, Pompeo just made a major deal in the Middle East. 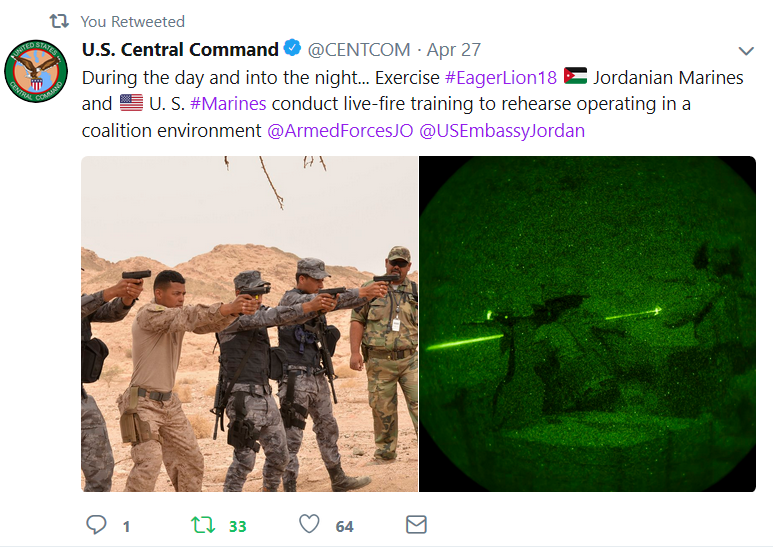 US Marines are in Jordan, working with Jordanian Marines. 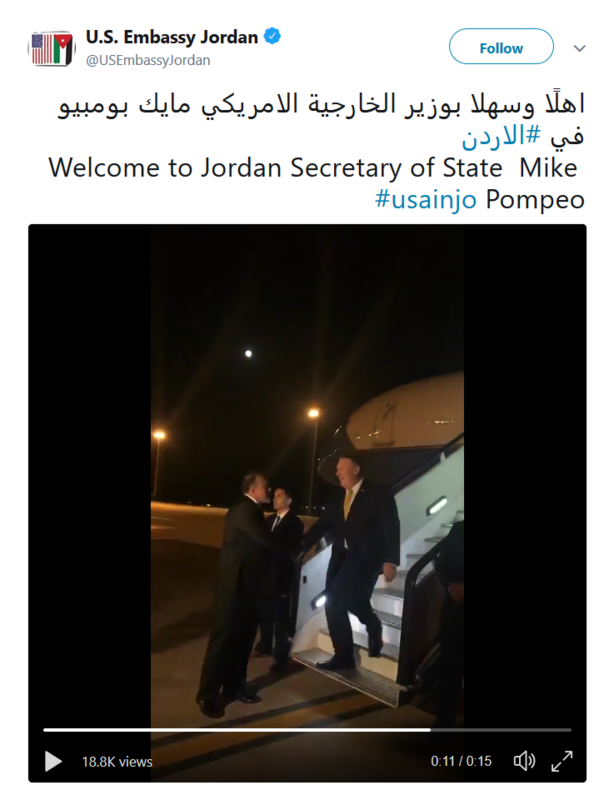 Pompeo just arrived there, signalling the situation is under control. 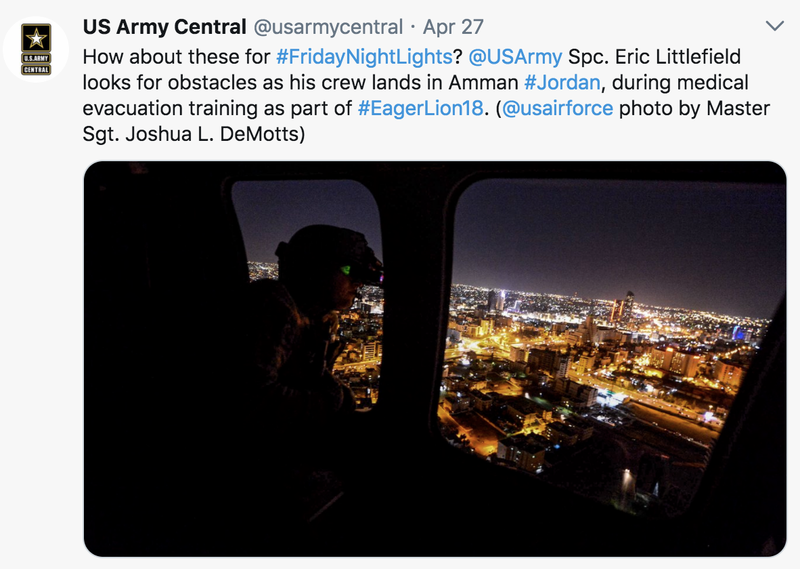 So… its implied that the Marines are working with the Jordanians to coordinate some kind of military operation – presumably a strike against some kind of base – and then… Pompeo strikes some kind of deal? Like he did in NK? If the Iron Eagle theory is true… Obama was using that shell company to move money all throughout Iran, and presumably, the Middle East. 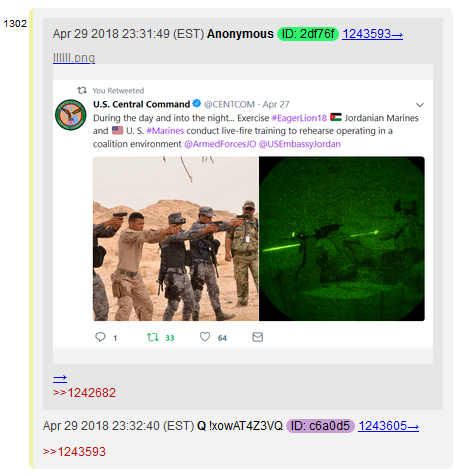 So, are the Marines going after Obama’s secret bases in Jordan right now, as a precursor to military operations in Iran? And with every passing day, Obama loses more leverage. 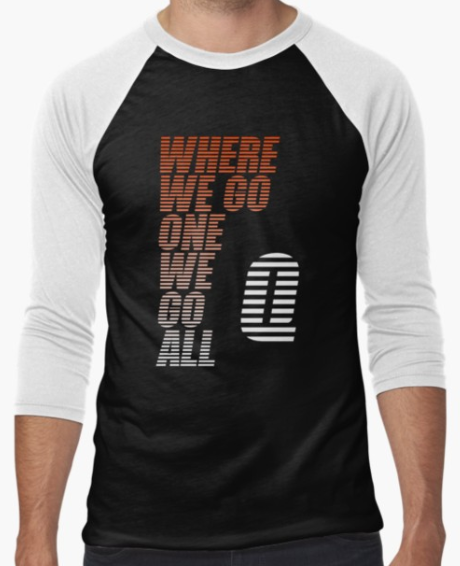 Say a prayer for our operators and leaders tonight, Legionaries. They’re going to need every ounce of strength and resolve to get this done. Evil never goes down without a fight. Almost 100 years ago, during World War I, the 91st Infantry Brigade was preparing to enter combat in Europe. The Brigade Commander, a devout Christian, assembled his troops and gave each of them a little card on which was printed the 91st Psalm, the same number Psalm as their brigade. They agreed to recite that Psalm daily. After they had begun praying the Psalm, the 91st Brigade was engaged in three of the bloodiest battles of World War I — Chateau Thierry, Belle Wood and the Argonne. Other American units that fought in the same battles had up to 90 percent casualties, but the 91st Brigade did not suffer a single combat-related casualty. 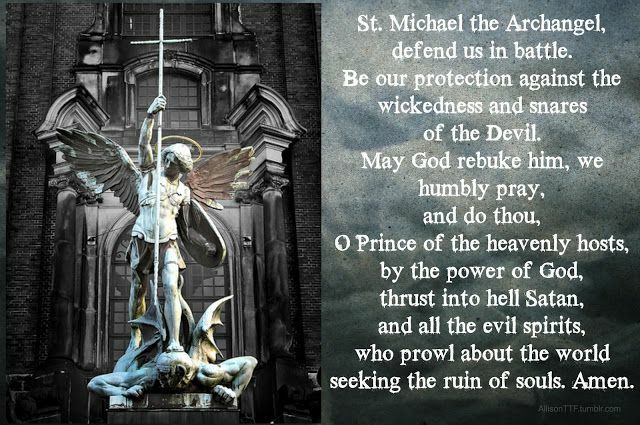 I love that prayer to the Archangel Michael! I have prayed it many a time in my life and will be praying it again for the success of our mission. 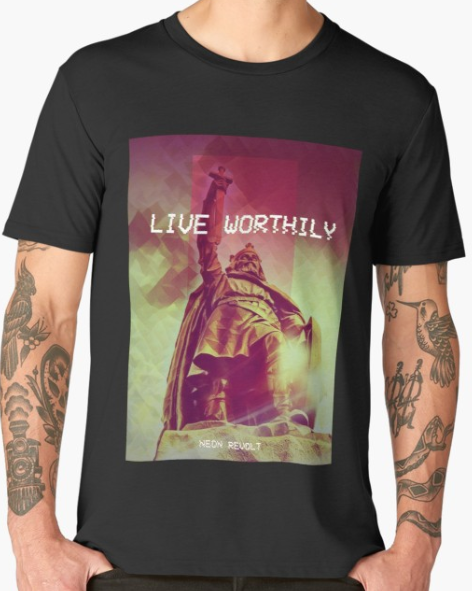 Thanks for your quick post! Today the country known as Moab does not exist, the area that was Moab during Biblical times is now part of Jordan. You think this could be connected to the attacks on Syria last night? I’ve seen R = Renegade = BHO, and I get that. I don’t get the “missing R” stuff. 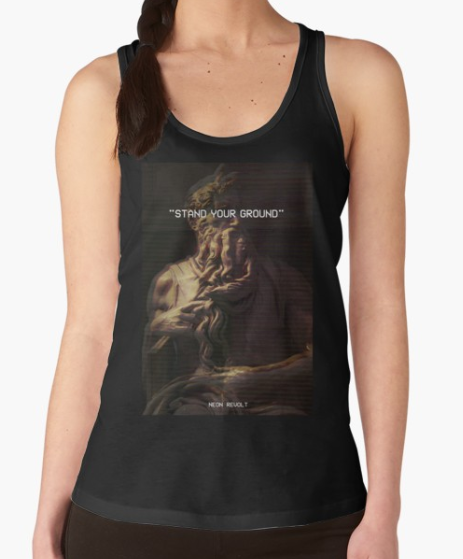 Maybe there’s something else I’m missing. The whole operation named is EagerLion18. 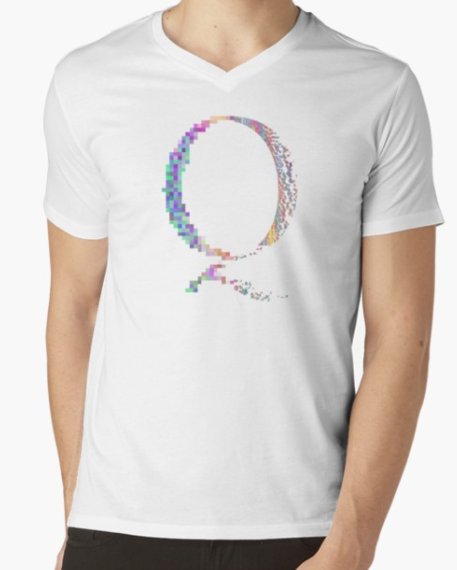 R is the 18th letter of the alphabet. Ah, ok. 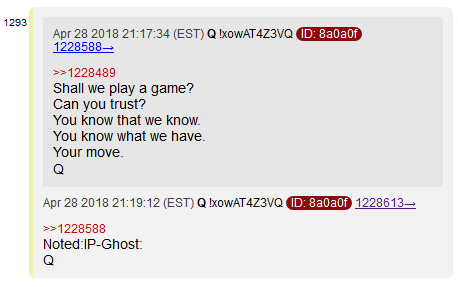 There were posts on the Q research board that left that part out. Netanyahu about to make announcement. Related? That was my first thought. 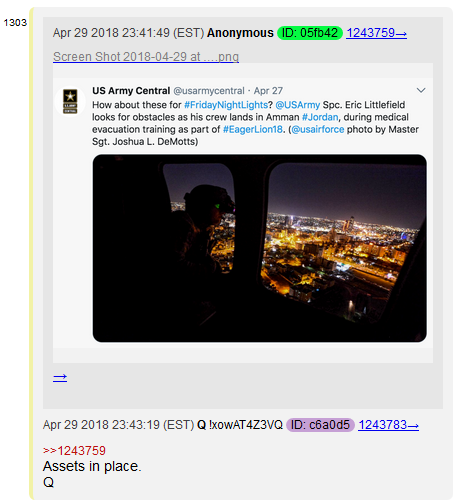 I saw the headline about Netanyahu making an announcement regarding the Iran nuclear deal, saw the DoD tweet again, and everything clicked. 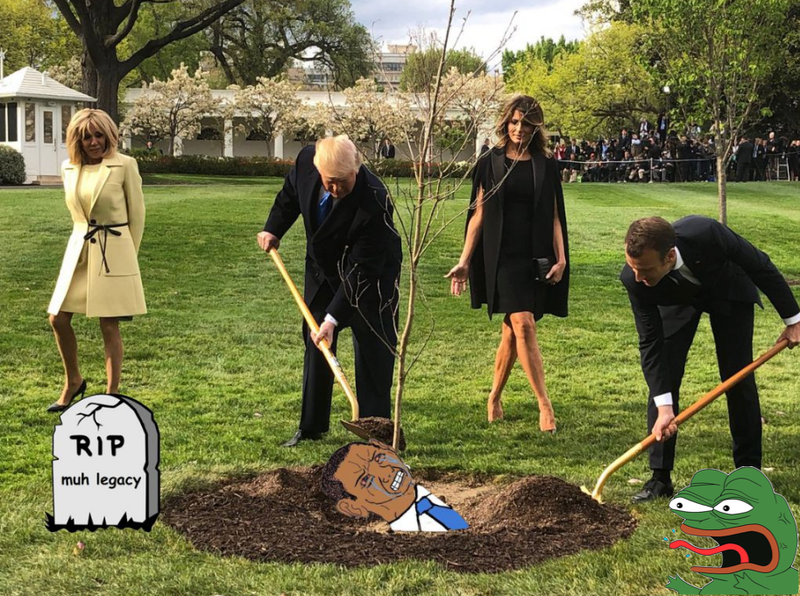 I understand they were going after Obama. Pray they had success! No. Obama was at Tom Hank’s house last night. Just another quick discovery for you, the Emmy association is called Natas! Think mirror of Satan! These people are sick! Yeah, that’s been shilled across the boards for a while now. I chose not to cover it because it’s dumb. 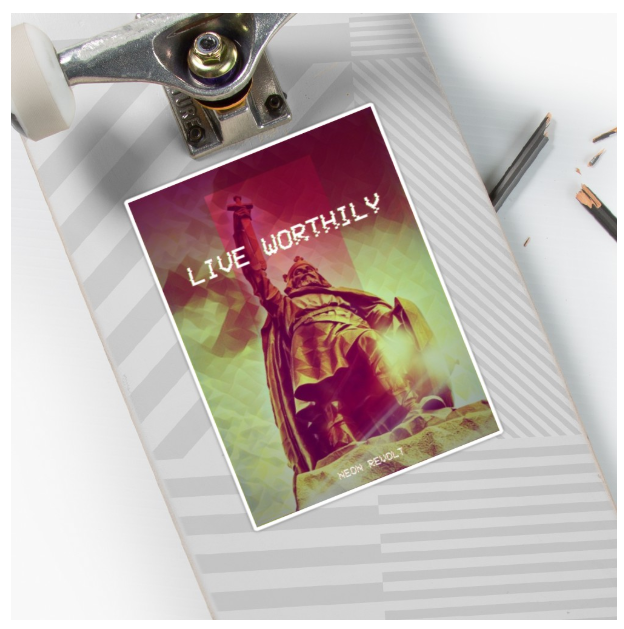 Picture from the tweet. Oftentimes military/police train on a full scale replicas of the scene. Who owns a house like that? 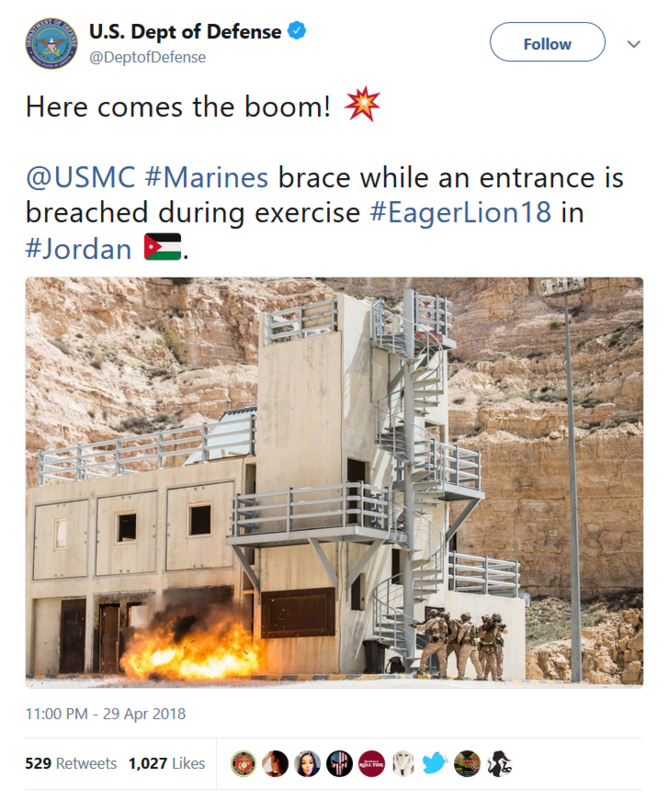 It’s a training facility in Jordan. The Grand Tour recently did an episode there, where they “stormed” that very same building.